Ready to register? Click here to sign up now online! Kellogg Community College’s women’s basketball team is holding a Girls’ Preseason Basketball Camp to help middle and high school girls get ready for the upcoming season. The camp is for girls in sixth through twelfth grades and will be held from 9 to 11 a.m. Saturdays, Oct. 21 and Nov. 4, at the Battle Creek Central Fieldhouse, 162 Champion St., Battle Creek. It will be led by players from KCC’s women’s basketball team and KCC’s Head Women’s Basketball Coach Dic Doumanian. Camp activities are designed to be high energy and will focus on the fundamentals of basketball, including instruction in shooting, ball handling, passing and individual defense. Campers can sign up for one or both sessions of KCC’s Girls’ Preseason Basketball Camp. The cost is $15 per session or $25 for both sessions, with registration open until the day each camp session begins. Sign up can be completed entirely online by visiting www.kccbruinyouth.com. 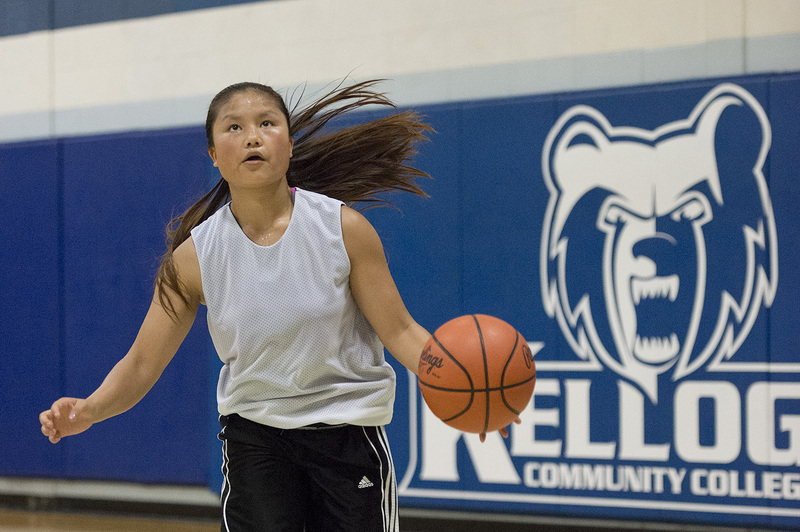 KCC’s Girls’ Preseason Basketball Camp is one of several basketball camps that the College offers year-round through its Athletics Department and Bruin Youth Programming initiative. For information about additional basketball camps and other KCC camps for youth, visit www.kccbruinyouth.com.